Croatia a country of 4.8 million inhabitants, has been in a political stalemate since June and it is a reflection of the present division among the electorate. The main parties consist of the Social Democrats (SDP) and the Croatian Democratic Union (HDZ). The leadership continues to focus on connections and rivalries of the past, which does little to solve issues that face the country in the present. The previous election was last November, but the HDZ dominated coalition government collapsed two months ago. This was due to a corruption scandal that involved the national oil company. The HDZ then moved to install a more moderate Andrej Plenkovic, who is a member of the European Parliament. He contrasts somewhat with the previous head who was staunch nationalist. The Social Democrats who held power from 2011 to January of this year, presided over a dismal economy. Out of the total five year period, only one showed any real economic growth. The years of stagnation and decline, paved the way for their rival to win late last year. 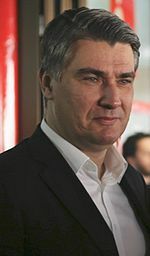 Zoran Milanovic has led the party since 2007. The new election will be held on September 11th. It will be the ninth parliamentary elections since Croatia introduced multiparty democracy. However, it is unlikely that either party will gain enough votes to form a new government. HDZ remains behind in the present polls and has a reputation for corruption, which recent events only reinforced. Yet, the Social Democrats are not able to capitalize much on this, because of their own grim record. 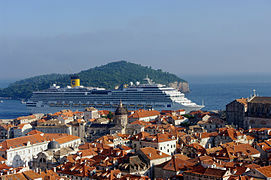 The Croatian economy has not done well since the beginning of the 21st century. This was especially the case, following the financial crisis in 2009. GDP (Gross Domestic Party) growth in Croatia averaged a meager 0.35% from 2001 to 2016. The country has been mired in recession for years. The economy continues to deal with lessening competitiveness and bureaucratic difficulties for investment. Little has been done in recent years to control government spending. The swollen public sector is undermining the private sector, which is prolonging and worsening the economic downturn. The overall GDP in 2015, was $48.73 billion USD (United States Dollar). It had reached a high of $70.48 billion USD in 2008, before starting its present downward trajectory. As late as 2014, it was still $57.14 billion USD. The GDP per capita in 2015, was listed at $13,807,35 USD. In Purchasing Power Parity (PPP) the GDP is $88.5 billion USD. PPP per capita is $20,889 USD. The economy has been doing better in 2016 than in many of the past few years, with growth accelerating to 0.6% in both the first and second business quarters. The most important sector of the economy is services, with tourism accounting for 20% of the total. Industry although declining, is still dominated by food processing, information technology, pharmaceuticals and shipbuilding. Exports of goods and services account for 46% of GDP. Household consumption is the main component of GDP, comprising 60% of all expenditures. This is followed by 20% for government and 19% for gross fixed capital formation. Croatia has entered a period of deflation with housing, transport and utilities dropping precipitously. The present rate is now -0.2%. Unemployment has remained stubbornly high over the past few years. The rate was at 18.5% at the beginning of the year, but by July it had dropped to 13.3%. As is the case in most other areas of Europe, youthful joblessness is far higher. In Croatia it stands at about 30%. In the summer of 2015, the rate was over 43%. Political stability is fracturing across Europe. Croatia joins the list of divided unstable governments that includes Ireland, Portugal, Slovakia and Spain. There is a growing fragmentation of the vote on both the left and the right. The mainstream parties of the center right and center left could once command 40% of the vote each. Today, they are struggling to achieve just 20% to 25% of the electorate. The ongoing financial crisis, stagnate growth, massive migration and terrorism have moved to the forefront of voter concerns. The populism sweeping across Europe now, is a reflection of the social changes that has occurred in response to a rapidly changing world. Traditional parties are struggling to deal with these divisive issues. New political movements of anti-immigrant, anti-austerity and anti-Europe are rising everywhere. In many countries they have already entered into national legislatures, where they can often tip the balance of power. In Austria for example, the far right candidate for president Norbert Hofer, just narrowly lost in an election held last May. Voting irregularities caused the results to be voided in July. Voters will return to the polls on October 02nd, and the former losing candidate is now ahead in public approval. His stance on stemming the flow of immigration and the opposition to open borders, is resonating with Austrian voters. Mr. Hofer is also questioning his country’s membership in the European Union. These positions have pushed him ahead with the electorate, over the previous winner Alexander Van der Bellen. Both Croatian mainstream parties have been unable to deliver on promised reforms. These include a decentralization power and needed economic incentives for investors. All 151 seats in the Croatian Parliament, will be contested in the election later this month. In the last election, HDZ was able to garner 33.4% of the vote, which provided them 59 seats. SDP as part of the People’s Coalition received 32.3% of the popular vote, giving them 56 seats. Currently the two parties hold 51 and 54 seats respectively. The third largest party MOST, has 12 seat currently down from 19 last November. There are five other smaller parties, that carry a smaller percentage of the electorate. The mainstream parties in Croatia continue to bleed constituents, making ruling coalitions ever more difficult to achieve. Candidates win seats to the Croatian Parliament by three different methods. The majority (140) are elected in ten 14-seat constituencies by proportional representation, using a 5% electoral threshold. Seats are assigned using the D’Hondt method, a highest averages method. Three of the seats are reserved for Croatian citizens living abroad or whose ascendants were Croatian. The remaining eight are for the ethnic national minorities that live in Croatia. The largest of these are Serbs, Italians, Hungarians, Czechs and Slovaks. Croatian President Kolinda Grabar-Kitarovic has been accused of favoring the HDZ, by delaying the decision to call for a new election by almost two weeks. The decision itself was signed in mid July, but it was not published in the Official Gazette until July 30th. Such a delay had never occurred before. The lapse in time may have provided Andrej Plenkovic an opportunity, to consolidate his position as the new leader of HDZ. It could of also helped in allowing the party to decide, what candidates will represent them in the upcoming election. HDZ unlike SDP, will be standing alone in that they will not be part of an official coalition. Plenkovic has already invited former prominent members to return to the party, in an effort to enhance electoral chances. SDP in contrast has formed the People’s Coalition, which includes the minor parties of HNS, HSU and most significantly HSS, which used to be aligned with HDZ. There are a number of even smaller coalitions that are being formed ahead of the election as well. 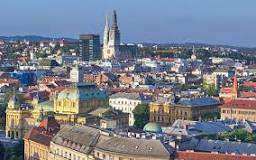 Regardless of the outcome of the vote, Croatia will still face a number of challenges that will not be easily solved. Pervasive corruption is widespread and erodes the overall public trust in the government. It also inhibits more foreign investment. Large state ownership of banking, transport and many natural resources has created an inefficient system in these sectors of the economy. The pace of privatization has been exceptionally slow. 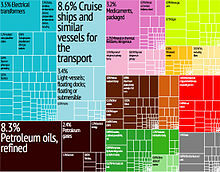 Graphical depiction of Croatia’s product exports in 28 color-coded categories. Efforts to improve the economy through much needed business and regulatory reform,will continue to be held hostage to political developments. Control over the public spending has deteriorated significantly. Annual central budgets have averaged around 5% over the past 3 years and GDP to debt is now at 86.7%. Before the financial crisis of 2009, it was only at 39.6%. As aforementioned, a divided government will be the probable outcome of the upcoming election. The political coalition finally formed, will be weak and unsteady. It will be held captive to past contentions and links, that will stymie efforts of real economic reform. It may also not be long lived, which will necessitate another round of voting. It is unlikely that there will ever be a large enough majority in the Parliament in the near future, in order to pass the needed legalization to move the economy and country forward. Previous Post → Colombia: The Civil War At An End?